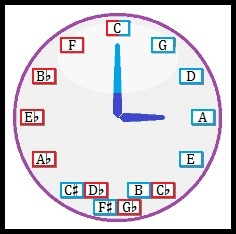 We mentioned that this was the equivalent of something called “The Circle of Fifths”. When we discussed intervals and inversions and all that, we determined that a perfect fifth is seven half steps in size, so you’d think we could keep making the notes go up by perfect fifths (or, to stay within the same octave, go down by the inversion of that interval, the five-half-step perfect fourth) and get all the way around our clock face. But there’s a catch! Recall that the designation “fifth” comes strictly from the note letter names. So C4 to G4 is a perfect fifth, but C4 to Abb4 is a diminished sixth, even though the pitches are the same. With this in mind, something odd happens if we try to go up by twelve perfect fifths. Let’s try going clockwise. 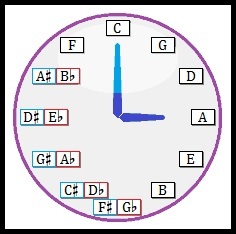 We start with C at the 12 o’clock position. Then, going up by perfect fifths (or, equivalently, down by perfect fourths) we have G, D, A, E, B, F#, C#, G#, D#, A#, E#, and finally B#. We did get to the same pitch, but not to the same note name. 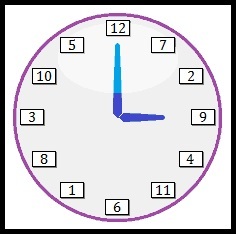 Let’s try going counter-clockwise now, going up by perfect fourths (or, equivalently, down by perfect fifths). Here we go: C, F, Bb, Eb, Ab, Db, Gb, Cb, Fb, Bbb, Ebb, Abb, Dbb. Once again: same pitch, different note name. The tracks of the same color move by perfect fifths/fourths. Going clockwise from C, you’d follow the blue track, but to go all the way around, you must eventually jump to the red track near the bottom. Similarly, going all the way counter-clocwise, you’d have to jump from the red track to the blue track to get back around to C.
Why does the crossover occupy three positions? Why does each direction go seven steps? Why didn’t they just keep it simple and make you jump tracks at the 6 o’clock position? There are actually good reasons why the tracks go as far as they do and no farther, which we’ll explore next time.